We are happy to announce that we received a pupdate from the proudest new dog parents! 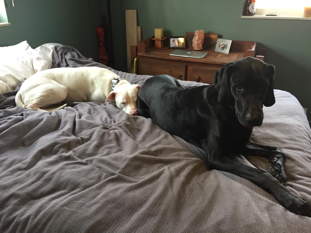 Lexi and her boyfriend adopted Zoe and she has since made their little family whole. Zoe has become a breed ambassador for bully breeds and is adored by all she meets. She loves long walks on the beach and hiking with her loving forever family. Zoe loves to spend time with her human parents and meets up with her foster family whenever she gets a chance! Zoe loves to make friends with new humans and dogs. I hope that you will continue to read our blog and follow us on social media to get updates on our new adoptables and amazing success stories. We are so excited that we got a pupdate from this super adorable family. Alexene adopted Dillon a very energetic and fun pup and he has kept them on their toes ever since. He loves to go running almost every day and is constantly learning new tricks . Dillon is also actively working on his relationship with other pups. Alexene and her husband are so happy that Dillon joined their family. Dillon loves to learn new tricks and his favorite trick is a high five. I hope that you will continue to read our blog and follow us on social media to get updates on our new adoptables and amazing success stories. Russell had been looking for a 4-legged companion for months when he finally found his match at Wags and Walks. These two were meant to be. Our employee, Jamie, was at the shelter one day and took a walk through the kennels to see if she could find any available dogs for Wags and Walks. 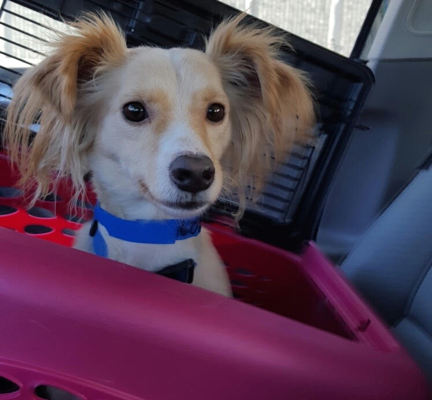 Xander, who had been in the shelter system for over a month, was patiently waiting in his kennel when Jamie asked to meet him. After a few minutes in the meet and greet area Jamie knew Xander was exactly what Wags and Walks was looking for- a sweet, kind, and loving pup. Jamie then took Xander to our partnership adoption center, NKLA. He was there for only an HOUR when Russell walked in. Russell, who had been to the shelter over 20 times looking for the perfect pup, said it was love at first sight. Xander and Russell both knew the perfect match would happen and patiently waited for the other. In one day Xander was saved from a high kill shelter AND found his forever home. Stories like these really prove that animals and owners are meant to be. We couldn’t be happier that Russell and Xander found each other. If you are interested in your own pup love story this Valentine’s Day please continue to read our blog and follow us on social media to get updates on our new adoptables and amazing success stories. We recently got a very exciting update about one of our adopted pups, Nellie, formerly known as Mazie! Jenna Chandler adopted Nellie and her entire family immediately fell in love with her. As with many pit bull owners, Jenna experienced some skepticism at her first from people close to her when she decided to adopt a pit. However, it only took one excited wiggle from Nellie for everyone to fall in love with her. Nellie is a curious social butterfly and loves to have her super soft head and belly rubbed at all times. When she sees members of her family she goes so excited that she almost wiggles out of her skin. She also enjoys wearing sweaters that compliment her family’s attire. Nellie fits in perfectly with the family, she is happy to stay in and cuddle on a lazy day or go on long hikes in the mountains. While on hikes she loves to squirrels and birds and play with any puppy that crosses her path. Nellie also loves to participate in all family events, even wedding rehearsals! We couldn’t be happier that Nellie found her perfect forever home. She has brought so much love and joy to this family. Oh, and about all those people that were skeptical about owning a pit? After knowing Nellie, they are convinced that pit bulls are one of the best breeds around.